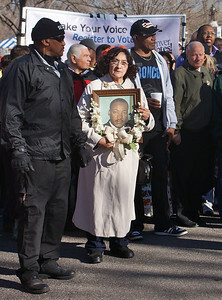 Woman holding framed picture of Martin Luther King adorned with flowers, waits for the Denver MLK Day march to begin. 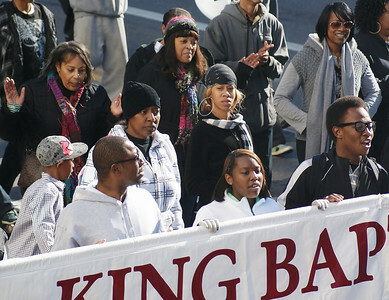 Baptist church members march in Denver on MLK Day. 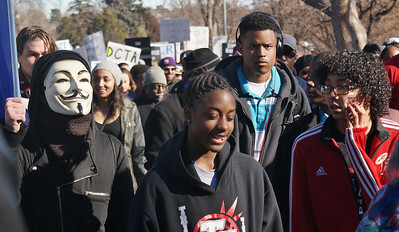 High schoool students marching in MLK Day parade in Denver. 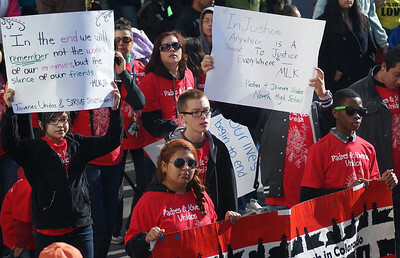 Preparing to march on MLK day in Denver. 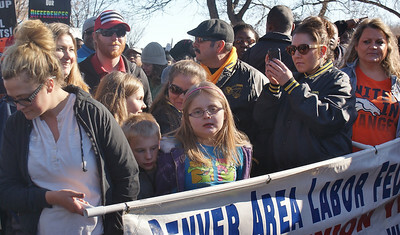 Union members and families prepare to march on MLK Day in Denver. 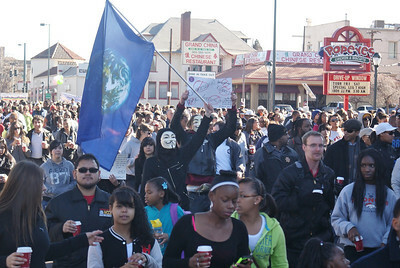 MLK Day marcher with Guy Fawkes/anonymous mask, marches in MLK Day parade. 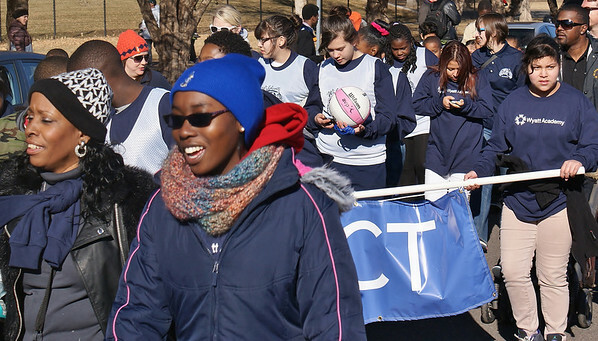 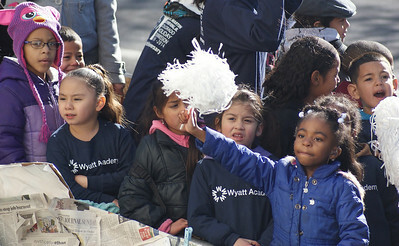 Students from the Wyatt Acadamy march in the MLK Day parade in Denver. 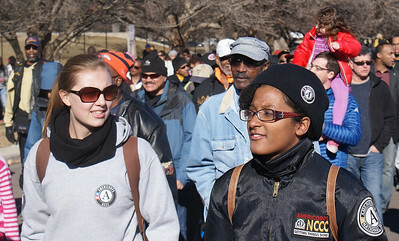 MLK Day marchers in Denver. 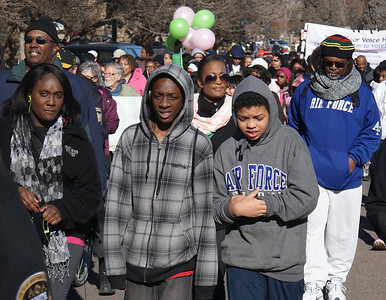 African-American youth march in the MLK Day parade in Denver. 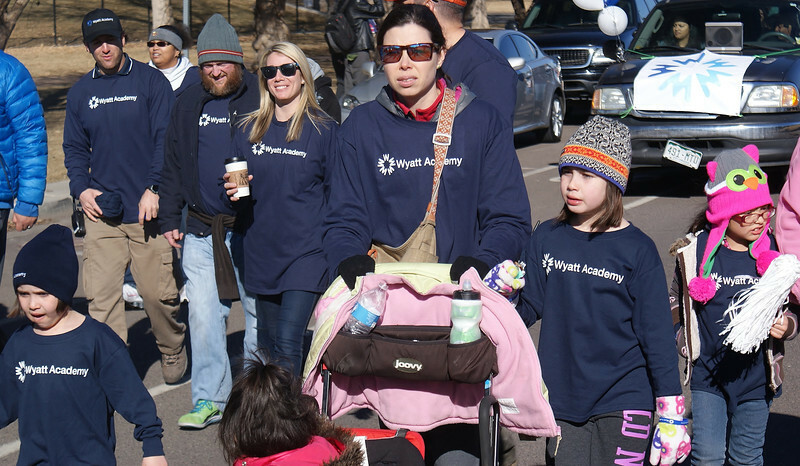 Wyatt Acadamy students march in the MLK Day parade in Denver. 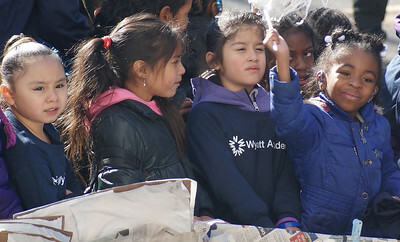 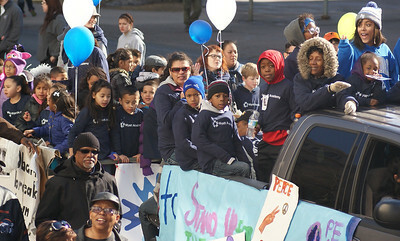 Young Wyatt Acadamy students ride in the back of a pick-up truck at MLK Day parade in Denver. 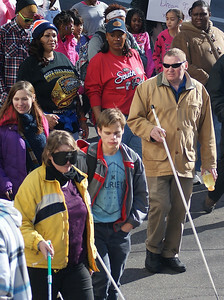 Blind people with canes march in the MLK Day parade in Denver. 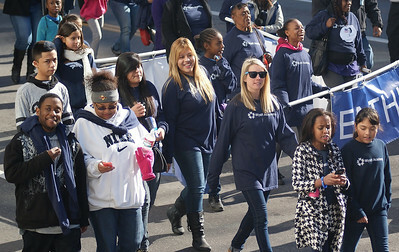 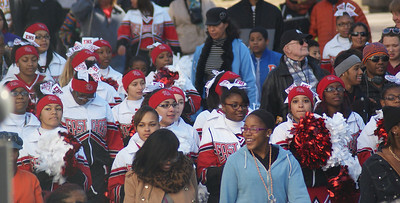 High schools cheerleaders march in MLK Day parade in Denver. 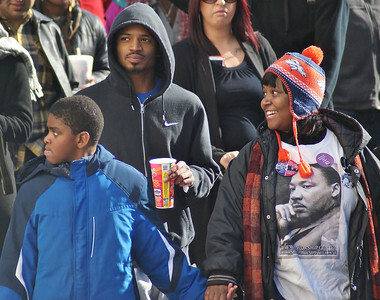 African-American father carrying son on shoulders during MLK Day parade in Denver. 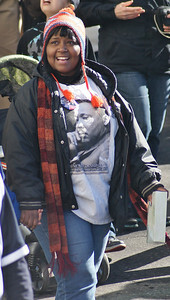 Smiling African-American woman wearing Martin Luther King shirt, holding sons hand while marching in MLK Day parade in Denver. 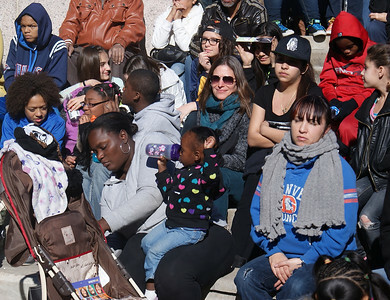 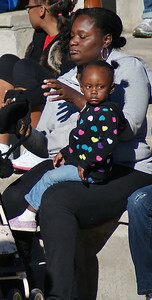 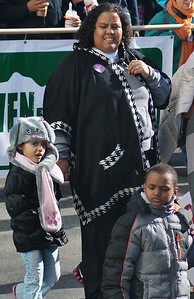 African -American mother with two children at MLK Day parade in Denver. 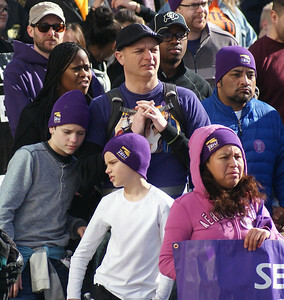 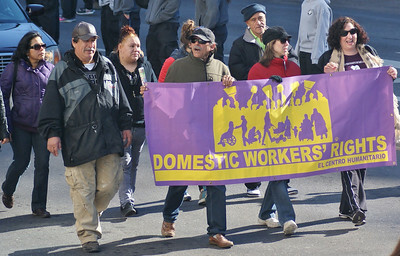 Members of Service Employees Union (SEIU) with children, march with banner in MLK Day parade in Denver. 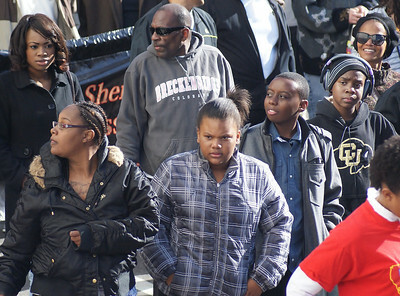 African-American family marching in MLK Day parade in Denver. 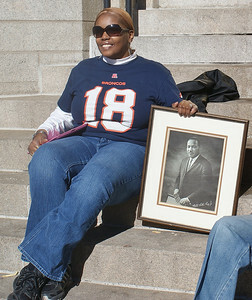 African-American woman wearing Denver Broncos #18 jersey, sitting on step with framed picure of Martin Luther King, aloon the route of MLK Day parade in Denver. 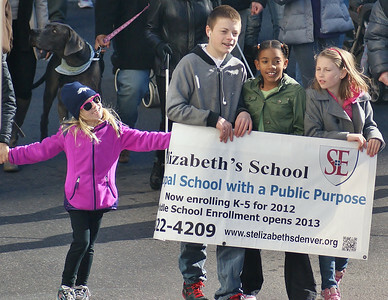 These kids display their schools banner during the MLK Day parade in Denver. 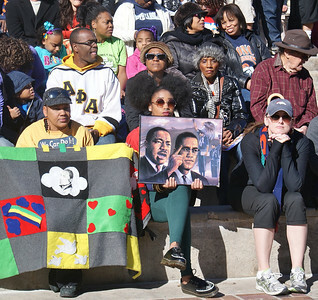 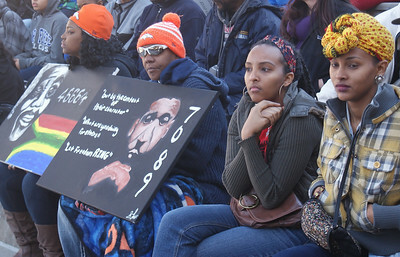 African-American woman holding painting of MLK and Malcolm X and another woman holding quilt, listen to speakers at MLK Day rally in Denver. 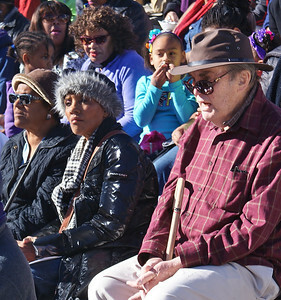 Older man with cane listens to speakers at MLK Day rally in Denver. 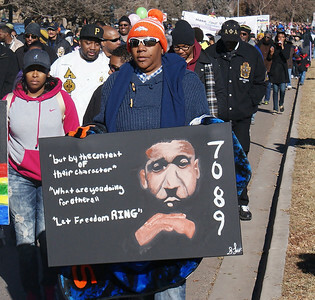 African-American man marches with sign with image of Martin Luther King and his prisoner number from the Birmingham, Al jail, at MLK Day parade in Denver. 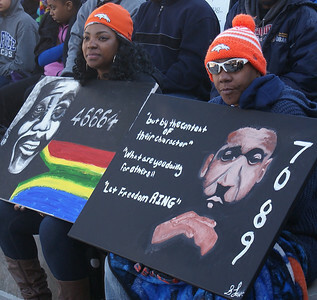 African-American man with sign with image of Martin Luther King and his prisoner number from the Birmingham, Al jail, at MLK Day parade in Denver. 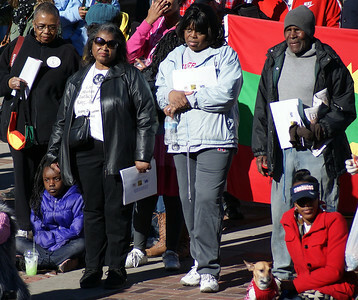 MLK Day marchers listen to speakers. 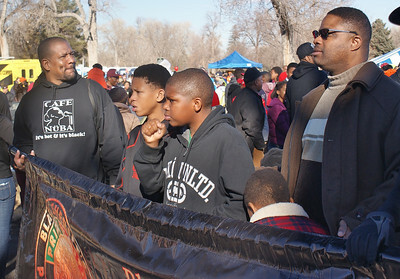 African-American children playing at MLK rally in Denver. 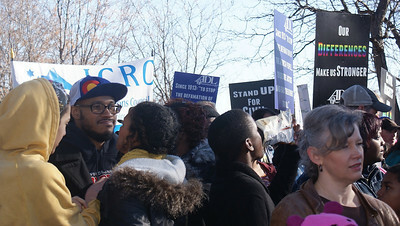 Crowd of people waiting to march on MLK Day in Denver. 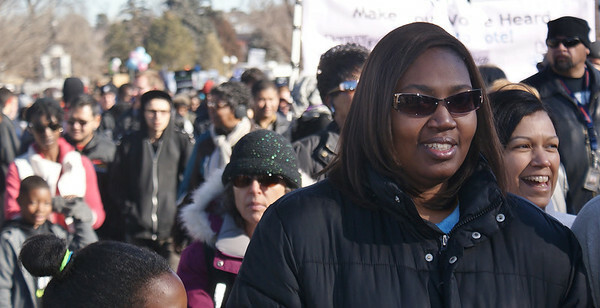 Young African-American woman marching in Denver on MLK Day. 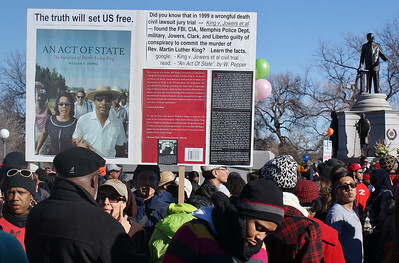 Man displays sign about MLK assasination near MLK statue. 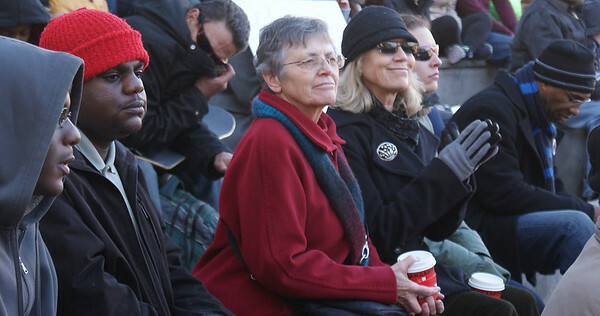 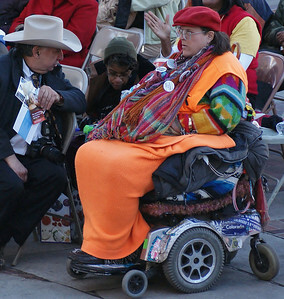 Woman in wheelchair and man in cowboy hat listen to speakers at MLK Day rally in Denver. 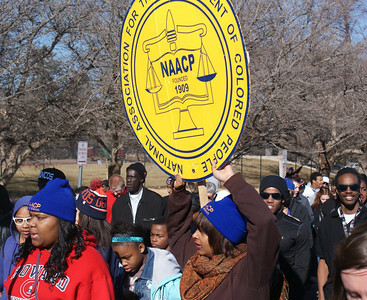 African-American woman holds a large NAACP sign during the MLK Day march in Denver. 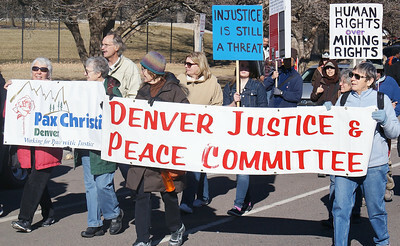 These peace and justice activists were among the marchers in the MLK Day parade in Denver. 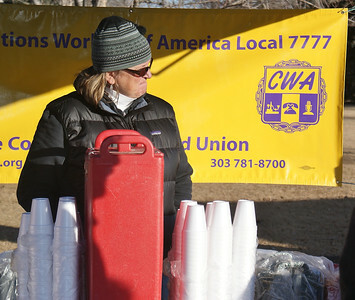 CWA union member staffing coffee booth. 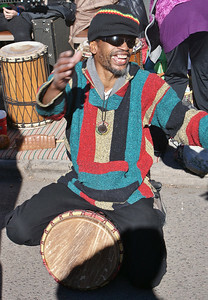 One of the drummers performing on the MLK Day parade route in Denver.